There is always something we do not know about those we know the best, some quirk of life or love that matters more than we can imagine. When those episodes, when those lifelines, or when those lives, are revealed, we can meet even our oldest and dearest friends as if for the first time. Anna Madrigal is by this time an old friend for readers of Armistead Maupin's Tales of the City series. Read the eight books that came before this, the last book in the series, and she'll be yours as well. In this short, powerful novel, Maupin manages to reveal to us one side of Anna that we've never seen; her boyhood in a Nevada whorehouse. It's as bawdy and outrageous as anything you'll read, and hilarious to boot. 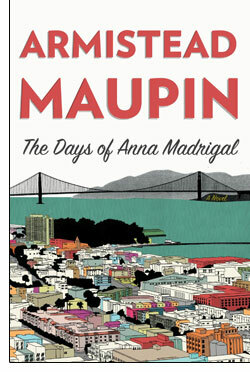 But Maupin manages to invest this book with the delicate power of a sunset seen through the Golden Gate Bridge. Anna is ninety-two as the novel begins. Jake is her perhaps too-kind minder. She's simplifying her life, in a manner that is radiant and filled with sweet nostalgia. So, when she gets the chance to attend Burning Man with Brian, she journeys from the heart of America's weirdest big city to the heart of America's biggest weird event. In alternating chapters, we meet Andy, a teenager in a post-Depression whorehouse in Nevada. Andy, who will become Anna, is about to embark on the journey that is Anna's life. Anna plans to stop in her old haunts on the way to Burning Man. Circles are all the rage. Readers can expect that Maupin handles Anna in the present with all the grace and she has earned. It's a beautiful performance. And, in the historical scenes, he proves he's just as adept building the world of the 1930's Wild West. The plotting for the book preserves Maupin's free-form, improvisational feel, but there's a very clever sensibility at work. Emotional and external plot arcs are perfectly balanced. This novel crafts a masterful story with minimal fuss. But make no mistake, this is an Armistead Maupin novel, so expect it to be both hilarious and spontaneous. You'll laugh just as much as ever when you read this, and that's a lot, considering the long thoughts at the heart of the action. Maupin is a man with a light touch that brings much meaning with seemingly no effort. For all that we find here, this is a brief novel, a quick read that resonates far beyond the single story we find. Maupin has crafted a finish that lives up to the rest of his wider canvas, a detail that echoes all the lives and all the loves he has brought us in these books. His sense of story, his ability to wrap our anecdotal lives into the larger tapestry of every life is nothing short of majestic. And yet, at the same time, endearingly silly. This is weird America at its best, and better still this is America, at its best; weird, silly and profoundly moving.